The following guide assumes that you have two external PSCs already deployed in the same SSO domain and site. Follow the installation instructions in the vSphere docs to do this. There is also a nice walk-through available. Now it's time to carefully look at KB2113315 which describes how to configure VCSA based external PSCs for high availability. If you are using Windows based external PSCs then you need to look at KB2113085 instead. I cannot really think of any good reason to use Windows for external PSCs, so I will solely focus on VCSA based PSCs in the following steps. Copy the downloaded zip file to the first PSC using an scp tool like WinSCP. This is a real challenge ... I suggest that you look at my VCSA 6.0 tricks post to learn how to use WinSCP to exchange files with the VCSA/PSC. Replace load_balanced_fqdn with the FQDN of the haproxy machine (e.g. something like haproxy.lab.local). Use WinSCP to download the file /ha.zip to your workstation and from there upload it to the root directory of the second PSC. Please note: This is one line. Again replace load_balanced_fqdn with the FQDN of the haproxy machine. Section D of KB211315 asks you to configure a compatible load balancer and points you to the relevant articles for the F5 BIG-IP and Citrix Netscaler. Extract the file ha.zip that you downloaded from the first PSC on your workstation in Step 4. 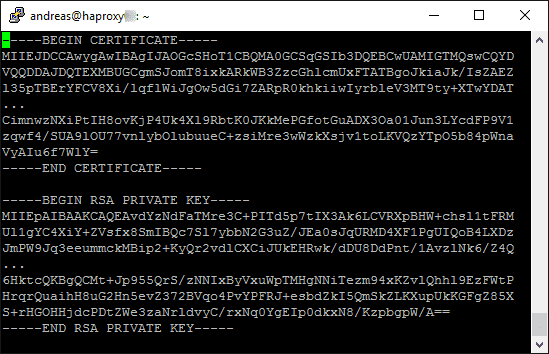 We need the files lb.crt (the load balancer certificate) and lb-rsa.key (the corresponding unencrypted private key). Create a new file named psc-frontend-443.pem using a text editor (like vi) and use copy-and-paste from your workstation to copy the contents of lb.crt followed by the contents of lb-rsa.key into it. So what the hell does all this mean? I will try to give you a basic understanding of how haproxy works and the configuration directives it uses. To get the full picture and for possible adaptions you will of course need to refer to the detailed haproxy documentation. I took the sections global and defaults from the original haproxy.cfg file that was installed with the package, adapted it slightly, and added a bunch of frontend and corresponding backend definitions. A frontend is a port that haproxy will listen on for incoming requests. Towards the vCenter servers haproxy needs to behave exactly like a regular PSC, so it needs to listen on all the ports that a normal PSCs listens on. On a frontend haproxy can forward basic tcp connections (mode tcp), but it can also act as an http(s) proxy (mode http): For the psc-frontend-443 (lines 39ff.) it uses the load balancer certificate and private key to decrypt incoming https requests and forward them to the real PSCs. All other frontends just relay tcp connections for the ports 389, 636, 2012, 2014 and 2020. All frontends forward incoming traffic to backends. In our case we have defined a single corresponding default_backend for every frontend. A backend is a group of servers (and network ports) to which the frontend traffic is forwarded to. 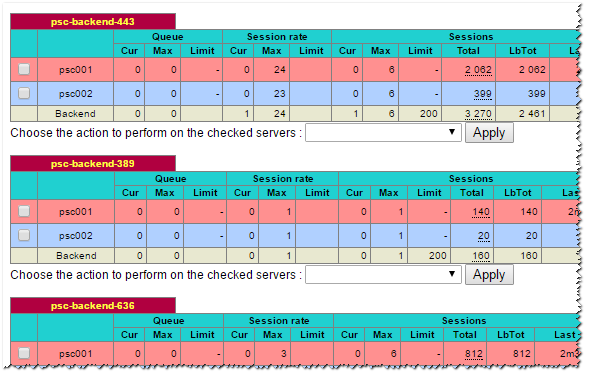 In our example each backend includes our two PSCs with IP addresses 192.168.40.80 and 192.168.40.81. These IP addresses is the only thing that you need to adapt to make the configuration file work for your own environment! For the second PSC we use the keyword backup to tell haproxy that it should always use the primary PSC (psc001) and fail over to the secondary (psc002, backup) only when the primary one fails. How does haproxy detect server failures? In case of the http backend I used the option httpchk which tells haproxy to check the availability of the service with an http command. In our example I have configured it to not use an expensive full HTTP GET command, but a lightweight HTTP OPTIONS command (on the URL /websso/) to do the check. The option ssl in the server line instructs haproxy to use https (instead of plain http) for the check, and because of the verify none parameter it does not do any certificate checks on the target servers. How can you monitor what haproxy is doing? haproxy has a nice builtin web based dashboard to display the status of the frontends, backends and backend servers as well as some traffic and connection statistics. In our configuration file it is enabled through the stats directives in the psc-backend-443 definition. There we define that the dashboard shall be accessible through the special URL /haproxy?stats and requires a login using the username admin with password admin. Later in my post I will provide an example of how the dashboard looks like. But watch out, we are not done yet with setting up our load balanced PSCs! We now need to run through section E of KB2113315 and update some URLs (that are stored in the PSCs' internal LDAP database) to point to the load balancer. Please note: This is one line! Replace psc_1_fqdn with the FQDN of the first PSC and load_balanced_fqdn with the FQDN of the haproxy server. The command will prompt you for the password of the local SSO admin [email protected] Be sure to provide it correctly. The command will happily run from beginning to end even with the wrong password and will then spit out some error messages that are easy to miss. The setup of the PSCs and load balancer is now complete. As mentioned in section F of KB2113315 you can now install a new vCenter server and point it to the load balancer for SSO configuration. If you already have vCenter servers deployed that use one of the load balanced PSCs directly then you need to re-point them to the load balancer. Fortunately this is a straightforward process, see KB2113917 for instructions. This is unsupported. Can we be sure that it works well though? In vCenter I did not notice any interruptions - I could log in to new Web Client sessions without issue, and even already running sessions appeared to be not affected or needed a reload only. After I rebooted the first PSC and it became online again haproxy immediately stopped using the backup PSC and routed all connections to the primary one again. Clearly haproxy meets these requirements! haproxy supports sticky sessions, but in our example we do not use them. It is really not necessary here, because we only have two PSCs, and at any given time only one of them is used. So all connections will always stick to the one PSC that is in use. Well, this is really a weak point when using haproxy. There is no straightforward way to group backends in a way that - if one service fails on a server - it is also no longer used for any of the other backends' services. So when for some reason only the web service dies on the first PSC haproxy will forward web requests to the second PSC, but continue to use the first PSC for all the tcp connections. This is only a drawback of our example configuration that I intentionally kept simple. You can somehow provoke the right behavior by checking the same service (e.g. the https port) for all backends: haproxy allows to define server checks in a very flexible way, so you can also have it check the https service for all the tcp ports and declare e.g. the LDAP service on port 389 failed if the web service is not answering. But this would also mean that the tcp services are not checked at all anymore, and a failure e.g. on port 389 would not trigger a failover to the second PSC. I have not really found a good and simple solution to this problem. If you are experienced in configuring haproxy and have a good idea then please chime in and post a comment! This is an easy requirement again, and haproxy can handle that. BTW I have defined common connections timeouts for all frontends and backends with the timeout directives in the defaults section of the configuration file. I already mentioned the dashboard, sticky sessions and flexible server checks. You can also have haproxy sending out e-mail alerts when a server fails. Another feature that I found very useful is that you can manually mark servers as down (or in maintenance mode) through the dashboard. That comes in handy for planned maintenance, e.g. software updates, on PSC node. Additionally I want to point out that you can also cluster multiple haproxy servers to form a highly available load balancer. What good is a load balancer when it is itself a new Single Point Of Failure (SPOF)? So if you implemented haproxy as a load balancer for a production environment then you would definitely make it redundant. haproxy is an excellent and widely used Open Source load balancer software. I would really love to see VMware officially supporting it for load balancing PSCs (and other VMware product components), and I will file a corresponding feature request soon. Please consider to do the same if you like to use affordable easy-to-use Open Source software in your environment! Great article, if I had time I would have tried it myself! Just one note for the sake of completeness you could use a free edition of Netscaler which has 5Mbps throughput limitation on load balancing which should not be a problem in this scenarios. Could be a viable solution for production. "So when for some reason only the web service dies on the first PSC haproxy will forward web requests to the second PSC, but continue to use the first PSC for all the tcp connections." you should use "track" option for backends, also having separate frontend and backend blocks for tcp is useless in this configuration, use listen. thanks for sharing! I will look into this.